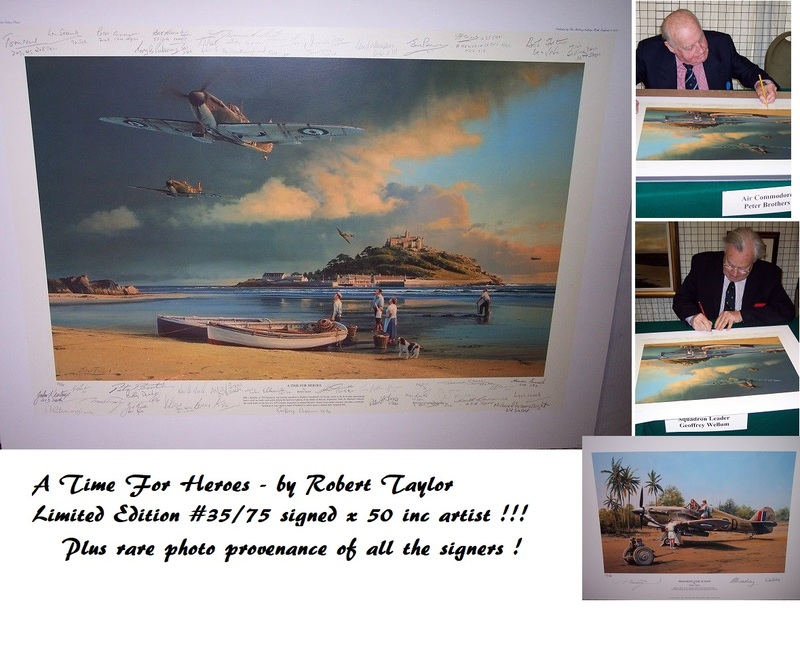 A real life Spitfire pilot and hero, who fought in Dunkirk, and Battle of Britain ! His legendary Second World War RAF Spitfire, a huge 1/32 scale model - Dimensions: 14" Wingspan, and 12" Fuselage, 10" high on stand. (approx). This is a very rare Corgi model (adult version), shown in its Squadron markings, as originally flown by WWII British fighter ace Robert Standford Tuck. The ultimate man cave or executive office item ! Probably the nearest you will ever get to having a real Spitfire. It looks awesome with its working navigation lights, spinning propeller , and realistic Merlin engine sounds !!! The base unit, has fully working aircraft style switches, to operate the engine and lights etc. The Spitfire model is a Mk1a, which is in Standford Tuck's first aircraft marking. The detail is incredible. The engine cowling, cockpit glass hatch, and wing inspection flaps move, and so do all the control surfaces. A real one-off rare collection ! Comes with original Corgi box. Complete with his authentic autograph and original envelope which could be mounted alongside for an awesome display piece. replica cockpit control stand, operating undercarriage, with working propeller and navigation lights. As flown by then Flt.Lt Robert Stanford Tuck, May 1940. 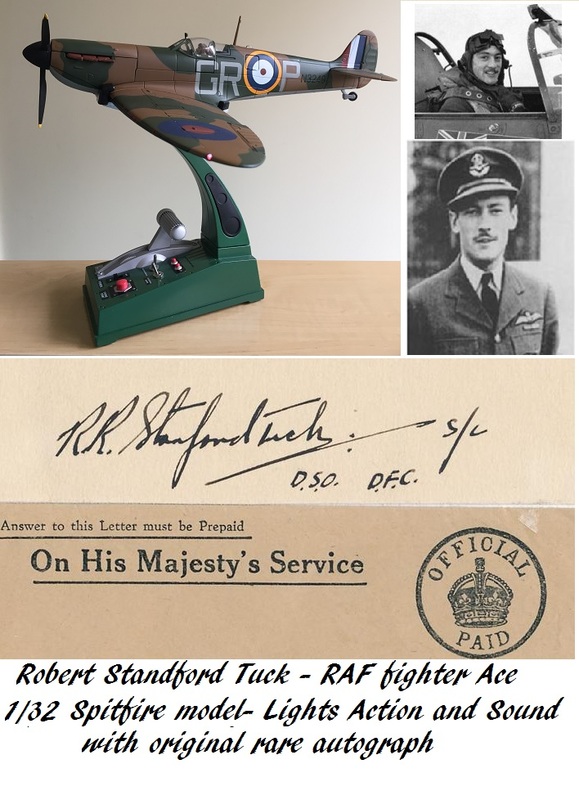 On May the 1st 1940, Robert Standford Tuck was posted to No 92 Squadron under the command of Squadron Leader Roger Bushel. This gallant officer was to become legendry as “Big X” at Stalag Luft III and led the famous escape. as a flight Commander by Bushell. on the morning of May 23rd, and added two Bf-110s during the afternoon. Tuck was hit and forced to “dead stick” his battle-damaged Spitfire on to the grass verge in front of the Hornchurch control tower. His personal score began to mount over the coming days. His bravery and skill was recognised, with the award of the Distinguished Flying Cross on June 11th. His Majesty King George VI presented his award at a ceremony at Hornchurch, on June the 28th. It was to be the first of many meetings with royalty. Tuck claimed 29 enemy aircraft destroyed and was a top RAF fighter legend. Lovely clear fountain pen ink signature by Robert Stanford Tuck. Comes with the original transmittal envelope. A very nice example of his rare 1940's signature. From RAF Coltishall England.